The Veeam VMware Advanced ESXi Hardware Monitoring (CIM-based) MP supplements the Veeam VMware High-Granularity MP and includes collection rules that allow you to monitor state of host hardware sensors. Assign the CIM interaction privilege. The CIM interaction privilege is required for collecting hardware sensor data using CIM over XML from vSphere hosts directly. 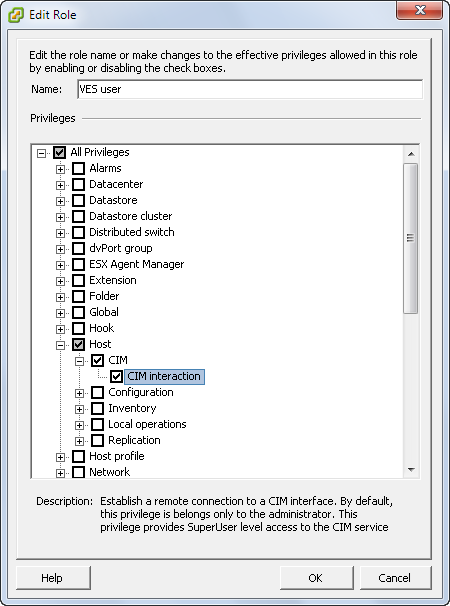 To assign CIM interaction to the user role, edit the role settings, go to All Privileges > Host > CIM and enable CIM interaction. The firewalls on vSphere hosts by default allow incoming connections on port 5989 for CIM data collection. Open Veeam UI and switch to the Veeam Collectors tab. In the Configuration section, select Collector Settings. In the Collector Settings window, set the HardwareSensors value to True.